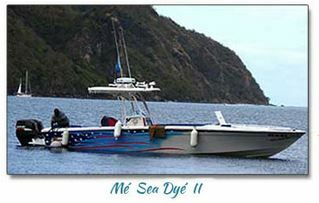 The Mé Sea Dyé is a 33-foot Powerplay Sportfish Twin Engine speedboat. It allows seating for up to 16 guests. I purchased it in 2010 to expand my tour itinerary to include exciting excursions by the sea. The Mé Sea Dyé II was bought to accommodate the demand for sea adventures. It is a 35 ft Avanti Twin Engine Powerboat that can hold up to 19 passengers. This boat joined my fleet in 2011. 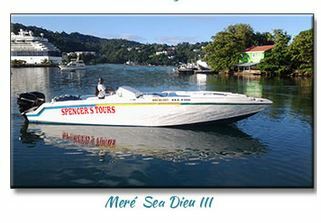 Our newest addition into the family in 2013, the Meré Sea Dieu III is an Enduros Super Hero 38 ft Twin Engine powerboat. With seating for 20 guests, it is my largest speedboat.